1.Brush the steaks lightly with oil and season with a little sea salt and freshly ground pepper. Preheat the barbecue flat-plate to hot before adding the steaks. 2.Cook the steaks on one side until the first sign of moisture appears. Turn the steaks once only. Test for the degree of doneness with tongs. Rare is soft, medium feels springy and well done is very firm. 3. Remove the steaks from the heat, cover loosely with foil and allow to rest for 2 to 4 minutes before serving. While the steaks are resting, toss together all of the salsa ingredients. Serve alongside the steaks. Rump steaks are a good all-rounder. They’re lean, full-flavoured and perfect for barbecuing. 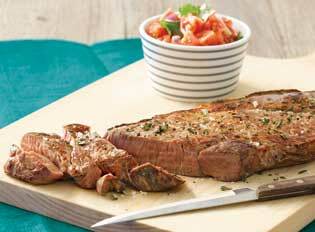 Best beef cuts for barbecuing: fillet/tenderloin, scotch fillet/rib eye, sirloin/porterhouse/New York, T-bone, rump.